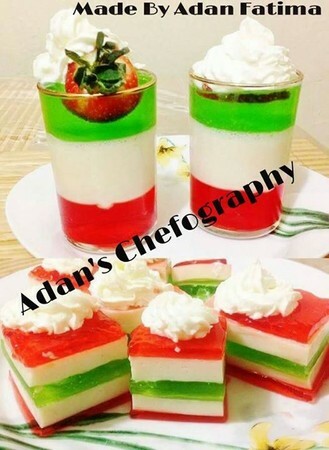 Jello Shots is one of the amazing and pleasant looking recipe. I searched Halal version on net, but failed because all recipes called for alcohol, today I got it on a Facebook page so sharing it in my blog. Mix half of red jelly mix in hot water. Pour it in a square dish and let it set. Dissolve gelatin in ⅓ cup of water and set it aside for 2 to 3 minutes than add ¾ cup boiling water into gelatin. In another bowl put condensed milk and 1 cup of hot water and mix it well. When it dissolves add the gelatin mixture and mix it well again. When red jelly is set, pour the one third of condensed milk mixture over set red jelly. Allow to set. Prepare green jelly mix and pour half of it on once white layer is set. Once green layer is set, then add a layer one third of white mixture. Then prepare remaining half red jelly and pour it over and once set, add white and finally remaining green. Finally cut it into small square pieces and top it with whipped cream and mint leaves.